Welcome to the gallery of Eva Lovi's images. Eva was born in Transylvania, from a Hungarian ethnic family. Since the 80s she lives in Israel, practicing medicine. Today she is working together with Itamar Siani, a Yemenite origin artist, on abstract painting with plenty of dynamics. They had many exhibitions in Israel, Europe and the States. Eva's first exhibition was in Yaffa (Tel Aviv) in last September, most recent one in June in Budapest. Their art group was participating in the Venice Biennale and the Rome Millenium events in summer 1999. 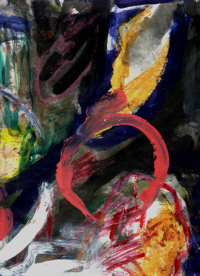 Current exhibit shows new images from the "Transylvanian Landscapes" series, all done with oil on carton in spring 2000. If you´d like to see Eva´s previous exhibits, visit our Archive. Click on the image or [enter] below to start your tour. Then you can use the image number buttons to proceed.